The end of the school year is barreling down on us. One week from today, my oldest daughters will climb off the bus for the final time as a third grader and a kindergartner, race up our driveway, and celebrate the start of summer vacation. To keep one step ahead of the end-of-the-year paper shuffling, I've been sorting, filing, and tossing some schoolwork that the girls have completed. During this process, I came upon the class picture of my third grader. Even though I've looked at this collage before, once again I was struck by the layout choice. In the middle is my daughter. Her picture is larger than the pictures of her classmates, her teacher, and her principal. 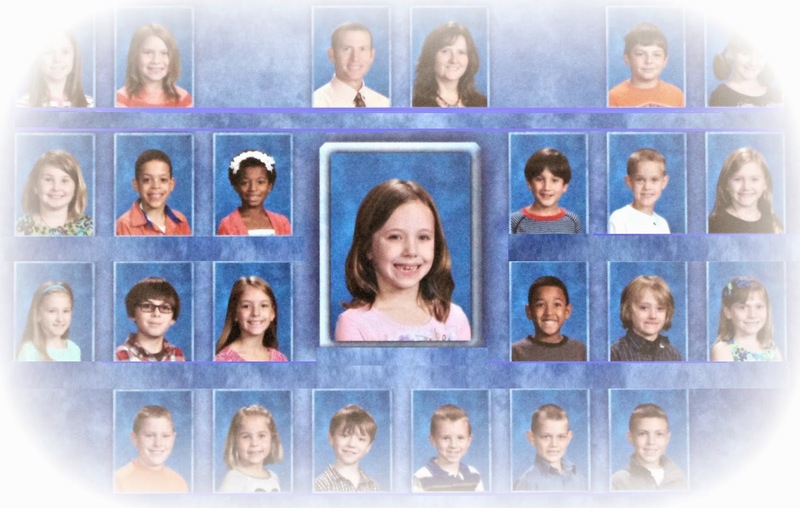 Every student received a class photo with their individual picture in the center while the other students rotated in the periphery according to alphabetic order. Our children are the stars of the show, the focal point. The story of their year in third grade revolves around them -- their perspective, their thoughts, their impressions, their experiences -- which is understandable in the sense that we all process life through the lens of our own perception. And yet, the layout -- though aesthetically fine -- rubs me the wrong way for one simple reason: I don't want my daughter to be the center of her own universe. I don't want any of my children to grow up thinking that the world revolves around them. Hear me out: I'm not blaming a photography company for society's bent toward self-centeredness. I'm not suggesting that this school picture is causing social or psychological damage to these third graders because their individual head shots are enlarged. The picture isn't the problem. The problem is that it's commonplace to transfer this practice beyond a class picture into real life -- to subscribe to the philosophy that we should always "look out for number one," or to subconsciously expect that our world should orbit around our needs and wants. And, gosh, sometimes we parent this way, too. We've let our worlds revolve around our children. Any parent will admit that we've catered to our kids' whims at some point simply because it was easier to yield than to stand firm. Some battles aren't worth fighting, after all. But some battles are. When my kids don't like what I've cooked for dinner, they get two choices: eat it anyway or eat breakfast tomorrow. When they fight and act rudely to one another, they have to apologize and make amends. When they demand that everyone else stops what we're doing because they're bored or displeased or unhappy, sometimes the best response they can hear boils down to two letters: No. In the midst of this chaos of raising young children, I have to remember that, ultimately, I'm raising children who will become adults -- adults who are resilient to setbacks, adults who don't crumple or attack when circumstances don't work in their favor, adults who are considerate of others, adults who are capable of seeing beyond themselves. So, for now, we work on simple principles at home. We teach -- and reteach -- our daughters that our family functions as a team, not merely a handful of individuals who abide under the same roof. Because we're a team, we're going to pitch in to help when help is needed. We're all going to clean up messes, even ones that we might not have created. We're not always going to get our first choice. We're going to be frustrated that life isn't always fair, and we're going to mess up, and we're going to try again tomorrow. While it might seem a delicate balance, it's not mutually exclusive to make our children feel valued, which they are, while also upholding that others are just as valuable. As contradictory as this sounds, I want my daughters to know that they're remarkably special, and at the same time, I want them to recognize that they're really not. Yes, they're fiercely loved. Yes, they're one of a kind. Yes, they're precious to us, to others, and to the God who dynamically and intricately made them. They have an important place in this universe, for certain. Unlike their school pictures, it's just not supposed to be in the center. 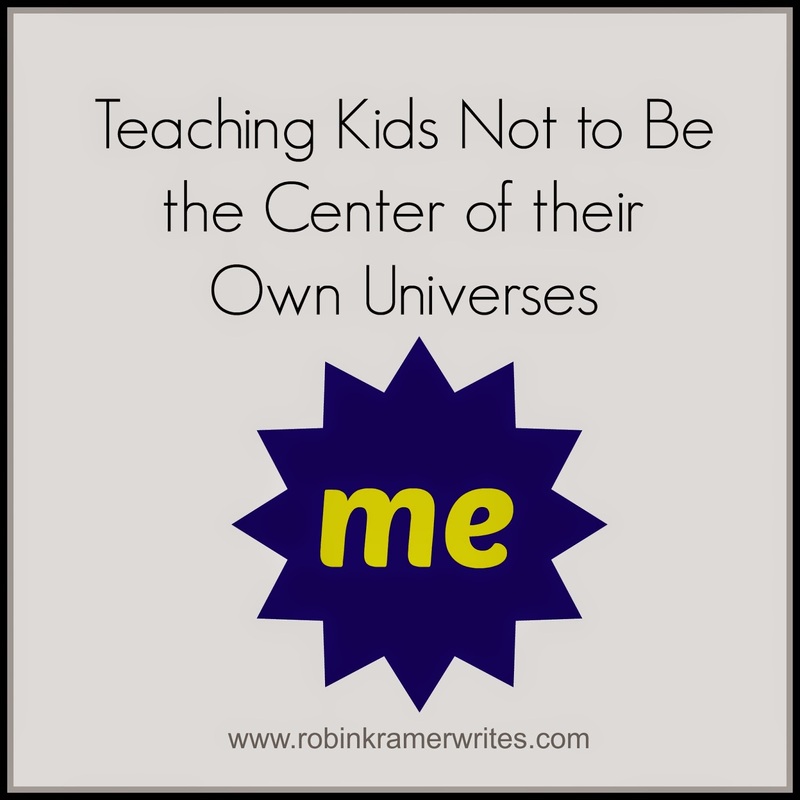 Robin, I've been so busy lately and not taken the time to read my favorite blogs, but so glad I came across this today! Your advice is, as usual, spot on. The challenge is in putting into practice what we know is true, when sometimes it's just so much easier to give in and coddle little bruised egos. Thanks for sharing your wisdom - here's to more parents staying strong and raising, resilient and other-centered adults! Why, hello again! It's so nice to have you visit! I think how you're raising your five and working to follow the same principles. (Not easy, but so valuable!) Thank you for chiming in! This has been a battle in our home. My children fiercely compete with each other for attention and to be heard. I've been attempting to teach them they won't always get their way. To respect one another, and their parents, to question their own intents, to accept responsibility for their actions (accidental or intentional), by owning up to it and then apologizing and asking forgiveness, and to seek guidance when conflicts are getting too intense. Its tough that's for sure, but love isn't always easy, either. "Love isn't always easy..." That is the truth! I've said to my oldest daughter, "You don't understand this now, and that's okay, but I'm doing these things that might make you mad now because I love you." It's so foreign to them who want us to give them exactly what they want (right now! ), but really loving them means that we sometimes have to give them what the *need* instead. Hang in there, Starr. You're doing a great job with your kids! Fabulous post Robin... as usual. I truly dislike this "self" and "entitled" perspective our children glean from society. It IS our duty to ensure that there is balance and that our children learn to love and serve those around them. Back at the beginning of the year, I ran into some stumbling blocks with my oldest. I had suddenly realized that in my (and my husband's) efforts to be firm and have consequences, my daughter was not clearly understanding the layers of reasoning behind these consequences. As a homeschooled child her world was fairly small; limited to Sunday School and biweekly parented homeschool gatherings. She hasn't had many opportunities to see adults setting boundaries and doling out consequences to children. Needless to say, she gained a perspective that we were simply unfair. We put her into Sparks (the first level of Girl Guides) and I knew it was a God intervention because her first few weeks they were working towards their citizenship badge. Amen! She is going to be a future citizen, an employee, and possibly a parent... these early years are integral to teach them that they are part of something bigger and that the "bigger" does not mean the world revolving around them. Thanks for sharing (sorry about the novella). I agree that having influences outside the home can be vital to help ground our kids and reinforce the lessons that we're teaching at home. Sounds like Sparks was a terrific fit for your daughter at a perfect time! I don't like the entitled perspective either. Many of my college students are amazing and grounded and responsible, but it does stop you in your tracks when I encounter a young adult who thinks that the world owes him or her something. Not pretty. Not one bit. This is so true. I've been teaching my girls for as long as they have been able to understand, that they are a part of the family, not the centre of it. When we all work together and respect everybody else's place in the scheme of things, we all get along so much better. Amen! It DOES go so much better when everyone is considerate of others! Oh, Siobhan, our kids also moan and gripe when asked to help, so rest assured, it's not just your otherwise charming son! It's not in our nature to automatically think of others before ourselves, which is exactly why we parents need to hang in there and teach these lessons again and again. Thanks for commenting! It's always great to hear from you!